Royal Gold Granite Kitchen from Stone Saver Inc. The homeowner replaced the existing island with this smaller version to facilitate easier traffic flow. Here the cook-top has already been removed. It’s a good idea to remove all drawers before installation to ensure dust, and debris don’t settle on your contents. The homeowner added the cabinets to the left of the refrigerator just prior to installation of the new tops. The “after” photos really exemplify what I was referring to. The backsplash no longer stands out, but rather is complimented by the sandy, taupe color of the Royal Gold granite. It also contrasts enough with the cabinets that the two are clearly defined. The flecks of ash brown pick up the bronze tone of the fixtures and hardware and work well with the black appliances. The high-bar overhang was extended to allow for bar stools and more comfortable casual dining. Matching granite window sills were installed to further pull the space together. A matching quarter bevel edge was applied to the island. A typical granite backsplash is four inches, but due to the existing tile we went a bit higher to ensure there were no gaps between the tile and granite. The homeowner was thrilled that they didn’t have to tear out the tile backsplash and ended up with a pulled together space that they will enjoy for years to come. Our most common installation; fireplace surrounds. You may recognize RealStone from the Crashers series of the DIY Network. Here it was featured on Bath Crashers. Realstone is available in a multitude of sizes, widths, and finishes. Here it’s featured on both the prep surface as well as the face of the bar. A welcome departure from standard wood, or tile flooring, Realstone complements the old world style of this home. Give your kitchen instant appeal with a unique backsplashthat will flatter both the rustic and contemporary palette. For the adventurous, an entire wall can completely change the feel of a room. Architectural features transform the cookie-cutter home to the exceptional. My absolute favorite. The piece de la resistance. Imagine this on a smaller scale surrounding a garden bathtub… your garden bathtub. White Carrera marble is all the rage right now on the pages of Houzz.com, Pinterest, and home remodeling magazines and tv shows everywhere. Although it has a very clean look, the problem with marble is that it can etch and stain very easily, which some folks look at as patina, but causes others to lose sleep at night knowing that the brand new kitchen they just spent thousands on now has a blemish. Well we’ve got a solution for that! Enter Vermont Danby. It’s a kitchen rated material that resists stains and etching, but still has the coveted look of White Carrera, without the headaches! Now note that I said “resists” stains and etching, so don’t leave red wine sitting on it for a week and expect that it will not leave a mark. All natural stone has its limits and you know we keep it real at Stone Saver and will never tell you something is 100% impervious to damage. Just use common sense and wipe up any stains within a reasonable amount of time and keep it sealed and your counter will remain just as beautiful as the day it was installed! Here are some photos of a recent job where we paired the counter with white subway tile. The look is a crisp, clean, kitchen just waiting for a would-be chef to grace it’s curves. 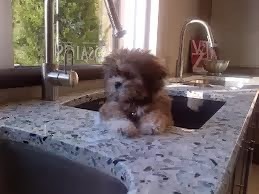 I just love the farm house sink! Here the counters contrast nicely with the espresso colored island and brushed nickel faucet and hardware. The wall cabinets are a pure white and we decided to add a little dimension to the backsplash by adding a pencil liner around a row of 6×6 tiles, followed by the 3×5 subway tiles in the center. This kitchen has it all with the built in cold wine storage and open shelving to house room temperature wine as well as favorite cookbooks. The stools the homeowner chose have a very cool retro vibe and the punch of orange spices up the kitchen and plays well off the red tones in the hardwood floor. We hope you enjoy our work and it inspires you in your own designs! We just completed the training to become authorized fabricators and installers of Vetrazzo glass countertops and can’t wait to put our first one in! I’ll give you a little insight into recycled glass tops and what to expect if you decide to put one of these beauties in your home! I found this picture online and couldn’t resist. Too cute! 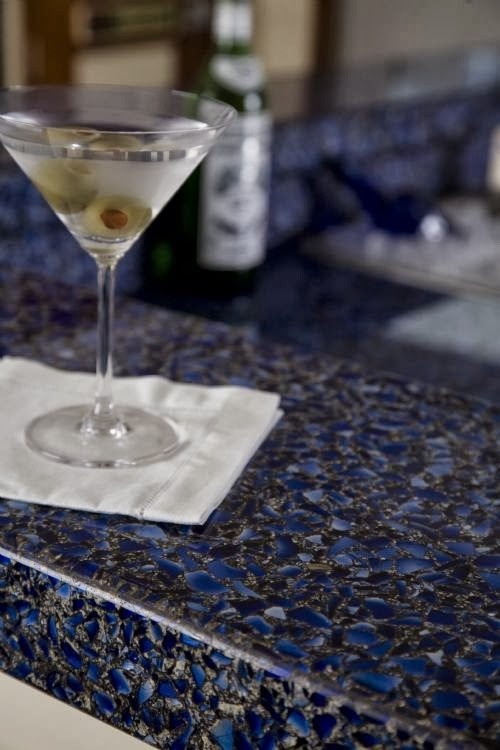 Vetrazzo is the name brand of recycled glass tops and has been in business since 1996, originally beginning in Berkeley, California. Since then manufacturing of the slabs has moved to Tate, Georgia where it is distributed nationwide. All of the glass in Vetrazzo is from 100% recycled sources. Vetrazzo comes in a variety of colors to match any color palette you can dream up. You can find anything from Skyy vodka bottles, to pieces of stained glass windows, to safety glass all in your recycled glass counter tops. At least 85% of every slab is comprised of glass with the other portion coming from a mixture of cement, epoxy, and a blend of proprietary materials. Vetrazzo reacts very much like natural stone in a number of ways and can be used inside for bathroom and kitchen tops, as well as outdoors in outdoor kitchens, or pools, both in residential and commercial applications. It’s not recommended for use outdoors in places that have extreme temperature changes so Florida is the perfect place to offer it with our typically hot, hotter, and hottest climate. This top is the Skyy Blue color with Patina applied to give it the dark background color. I hope you enjoyed this article! 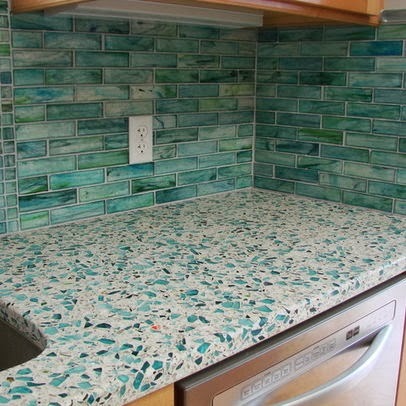 We can’t wait to put a Vetrazzo top in your home! Central Pasco Chamber of Commerce’s Newest Member! We are so excited today to announce we are now members (again) of the Central Pasco Chamber of Commerce! Stone Saver has always been involved in the Lutz community, but unfortunately when the economy took a nose dive a few years ago we had to tighten up our belts to remain viable. We are happy to report that we are doing well and are now able to rejoin many of the community organizations we once belonged to! The Pasco Chamber is a great supporter of local businesses both large and small and we are proud to once again be a part of this organization! I hope everyone had a safe and happy Memorial Day weekend! I’ve received requests from a few of our customers to post photos on our blog of work we’ve completed for them and of course I’m more than happy to oblige! We love showing off our work any chance we can get and are very flattered that our customers can’t wait to show the world what we’ve done for them! This granite color is called Brass Blue with an Ogee edge. Gorgeous material, but very delicate due to the deep veining that runs through it. Jose, our fabricator did a great job of book matching the backsplash. The kitchen looks amazing with the white cabinets! It really brings out the subtle blue tones of the granite. This entire bathroom was done in Scabos Travertine. This photo was taken prior to it being completed, but you can tell it will be beautiful! The floor and the strip (called a listello) running along the wall is in a Versailles or French pattern which is very popular at the moment. It really gives the travertine a lot of dimension and brings out all the natural colors. Our customer installed this himself and we supplied the tile. He did a fantastic job! I’ll show photos later in this blog of the counters we installed in his kitchen. This kitchen features Juparana Nambia granite. It’s prized for it’s movement and really works well with the homeowner’s existing tile flooring. With the stainless appliances, white cabinets, and oil rubbed hardware it wasn’t hard finding a color that would compliment the surrounding decor beautifully. The edge detail shown here is a half bullnose. This granite is called Carpe Diem and for good reason! It inspires me to “seize the day” by cooking a fabulous meal! This is the kitchen to the home with the travertine tile shown earlier in the blog. I could go on and on about this kichen between the beautiful rustic wood floors and the simple craftsman cabinets. I wouldn’t change a thing about it! I can’t wait to see what he plans to do for the backsplash. Santa Cecelia with a Straight polish edge really take these oak cabinets to the next level. I love the random pattern in the tile on the floor. The flooring was existing prior to Stone Saver’s work, but I wish we could take credit for it! I hope you enjoyed the fruits of our labor. I’ll be posting more photos as they come in!